Engineers have developed a robot that they claim will eliminate some of the unknowns of mine-rescue operations and arm first responders with information about the situation. 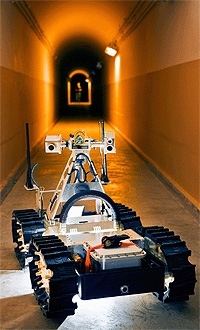 Robotics engineers at Sandia National Laboratories have designed the Gemini-Scout Mine Rescue Robot, which finds dangers such as poisonous gases, flooded tunnels, explosive vapours and unstable walls and roofs, and can provide relief to trapped miners. It is reportedly able to navigate through 18in of water, crawl over boulders and rubble piles, and move in ahead of rescuers to evaluate precarious environments and help plan operations. Less than 4ft long and 2ft tall, Gemini-Scout is said to be agile enough to navigate around tight corners and over safety hatches 1ft high. In addition to giving rescuers an idea of what they are headed into, the robotic scout can take food, air packs and medicine to those trapped underground. It is equipped with two-way radios and can be configured to drag survivors to safety. Designers built the Gemini-Scout to negotiate nearly every known mine hazard. Gases can ignite if exposed to sparks, so the electronics are housed in casings designed to withstand an explosion. ‘Such measures would prevent a spark from causing further destruction. While it might harm the robot, it wouldn’t create another dangerous situation for the miners or rescuers,’ Salton said. To ensure functionality in flooded tunnels, Gemini-Scout’s controls and equipment needed to be waterproof. In addition, engineers had to build something intuitive for new operators who need to learn the system quickly. To overcome that challenge, they used an Xbox 360 game controller to direct Gemini-Scout. ‘We focused a lot on usability and copied a lot of gamer interfaces so that users can pick it up pretty quickly,’ said Sandia engineer Justin Garretson, the lead software developer. The US National Institute for Occupational Safety and Health (NIOSH) provided funding for the efforts, which have been underway for the last three years. If all goes well, the Gemini-Scout could be ready to head underground by the end of next year.